There are a lot of misconceptions around scope mounting. With the help of a scope mounting kit you can eliminate the mystery and get it done right the first time. Expensive rifle. Check. Expensive Scope. Check. Scope mount and rings. Check. A way to mount it all correctly?…keep reading if you want to save a bunch of headache on mounting your scope properly with one of the best scope mounting kits. 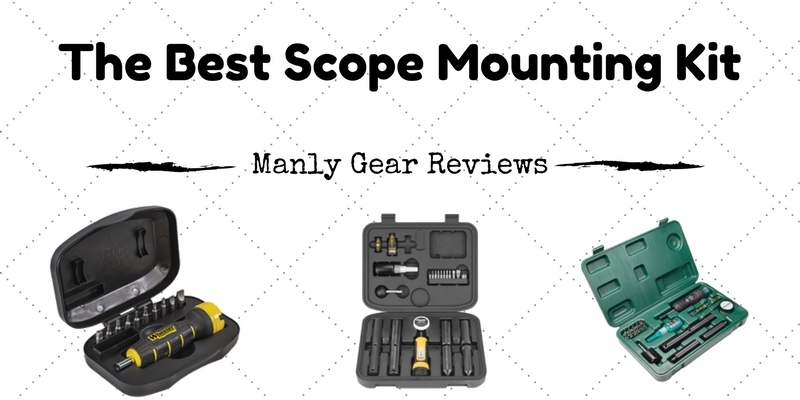 Scroll down find out why the Wheeler Scope Mounting Combo Kit won our Editor’s Choice award. Durability: Nothing is worse than buying crappy tools initially only to have to go back and buy a better set the second time. I personally have learned that lesson long ago and try to keep to it as I add more and more tools to my collection. Value: You’ve already spent a load on that rifle and scope. 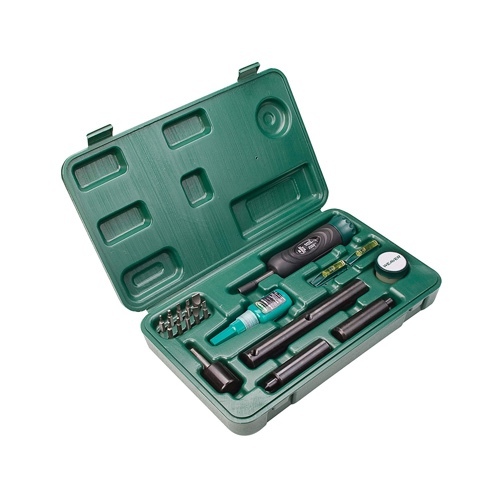 No need to continue emptying the wallet on ultra premium tools to put it all together. Our recommendations are not the cheapest, but they do give the most value for your dollar. Torque Importance: Rings these days come in many different shapes and sizes. Most standard top clamp rings require somewhere around 18 in-lb of force per screw. Some unique designs like ARC’s m10 ring with the single screw top clamp method requires 65 in-lb of force. On a traditional set of rings, 65 in-lb would either crush your scope tube or at a bare minimum strip out the screw and ring. It is very important to be able to accurately mount your scope and apply just the right amount of clamping force to avoid damage or slippage. The Wheeler Scope Mounting Combo Kit has been the go to tool in my modest gun smithing set. 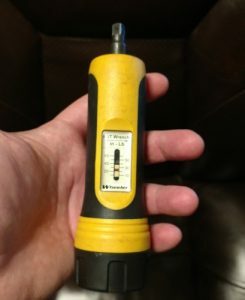 As you can see from my Wheeler torque wrench, it has been heavily used for many years and it keeps on ticking. Torque values continue to be true and the adjustment wheel still holds nice and tight. As stated above, being able to consistently apply correct torque values to your rings is incredibly important. As a secondary use, you can also torque your action screws on your bolt guns to the same torque each and every time allowing increased repeatability when removing the action from its stock. The Wheeler kit also includes lapping bars for 1″ and 30mm rings. For those of you are are unsure, lapping rings ensures that you get maximum contact between the rings and the scope. Many times are low and mid range rings, one ring can be getting close to full contact and the other can be getting anywhere as little as 20% contact. Lapping the rings, when done properly, takes off just enough material in the ring to ‘true’ them up so you have full contact. If you look closely, you’ll notice the kit comes with 4 additional bars with pointed ends. No, these are not extra lapping bars. What sets the Wheeler kit apart from other scope mounting kits is the fact that these test fit scope bars are included. Basically, before and after lapping you mount these bars in each ring with the pointed ends facing each other. If the points do not line up with each other you know the rings either need further lapping. If the points do match up you know know you are good to go and that you will have good ring contact on your scope. For such a simple tool, these have proven very valuable in testing scope to ring fitment without actually damaging the scope. The bit attachments that come with the tool are of high quality and include many of the common bits needed for most rings and rifles. The bottle of loctite is a nice touch and should be a requirement every time you mount a scope. The levels can get you by, but you would be much better served with the Wheeler Professional Leveling Kit. All things considered, the Wheeler Scope Mounting Combo Kit is what we consider the best scope mounting kit you can currently buy. The Wheeler Professional Leveling Kit is about as close to leveling perfection as you can get. This fantastic leveling setup is milled from a solid block of aluminum and is extremely stout. How do you use it? It’s quite simple in fact. Loosen and slide the barrel clamping level over your barrel as close to your stock as possible. Lightly tighten these bolts just to hold it steady. Place the other level on top of your action, hopefully you have a nice flat place to put it (like a scope mounting base). Match the barrel clamp level to the level on top of the action and tighten the screws. Mount the scope and place the level you had on top of the action on top of the elevation turret on the scope. While there are certainly other tricks to mounting a scope and making sure everything is completely level. The Wheeler Professional Leveling Kit certainly makes everything a lot easier. 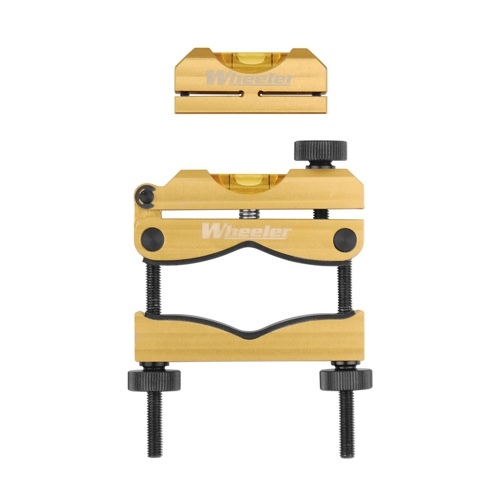 The Weaver Deluxe Scope Mounting Kit is relatively new on the scene. Weaver is typically known for their scopes which historically have offered a great value for the dollar. Quality wise, this kit is very similar to the Wheeler kit that won our Editor’s Choice. The reason it did not win is because it only comes with 1″ lapping bars. 30mm lapping bars can be purchased separately however. Another thing of note, as with the Wheeler kit the included levels are good enough to get you by but you really want to get a more robust leveling system similar to the Wheeler Pro levels. If the Weaver kit has anything over the Wheeler it is the quality of the case. When dealing with this many small pieces its nice to be able to keep them organized in a well thought out, sturdy case. I’m a firm believer in that a bare minimum you need a decent torque wrench when doing any work on guns, let alone when mounting a scope. 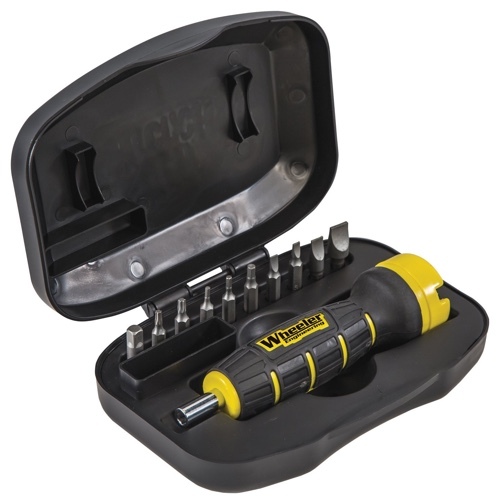 The Wheeler Digital Torque Wrench is a newer product but has proven to maybe be the new standard for torque wrenches. 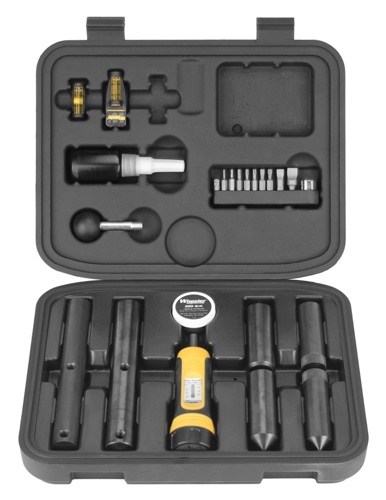 What makes the Wheeler Digital Torque Wrench unique is…you guessed it, you dial in the amount of torque you want digitally. With the analog torque wrenches it’s pretty easy to get within 1in-lb of torque on the readout gauge. On the digital wrench you are able to dial in the exact poundage that you want. Another neat feature on the digital torque wrench is the fact that it shows real time torque measurements. Meaning regardless of what torque you have the wrench set to you have the ability to monitor what poundage you are currently turning at. This can be handy when wanting to make quick adjustments on something that requires less torque than what you have the torque wrench currently set to. Not everyone can pull the bolt out of their rifle and do a quick bore sight to get on paper just eyeballing it. Without a good bore sight job sighting in your rifle can quickly become an exercise of patience instead of a fun activity. The Wheeler Professional Laser Bore Sighter is an easy to minimize wasted ammunition when sighting in your rifle. The laser sits on the end of your rifle, so it isn’t chambering or bore specific like some other bore sighters. The laser is usable out to 100 yards. One thing to note, this is not a zeroing substitute. While the Wheeler Laser will get you within a couple MOA to your zero, you still have to shoot your ammunition through your rifle to verify zero. While certainly a luxury item if you are skilled at bore sighting without tools, if you find you are wasting ammo downrange while trying to sight in the Wheeler Professional Laser Bore Sighter is for you.